We have seen a rise in customer demand for high quality, authentic and portable street food. Noodle Bar is our new Asian inspired concept to meet this need. It’s big on flavour, good value for money, exceptionally healthy for today’s lifestyle conscious customers and above all it is bang on trend! Customers choose their Noodle Bar pot which is packed with fresh spiralized veggies, noodles and some protein from the grab and go chiller. They top it up with broth from the soup counter. 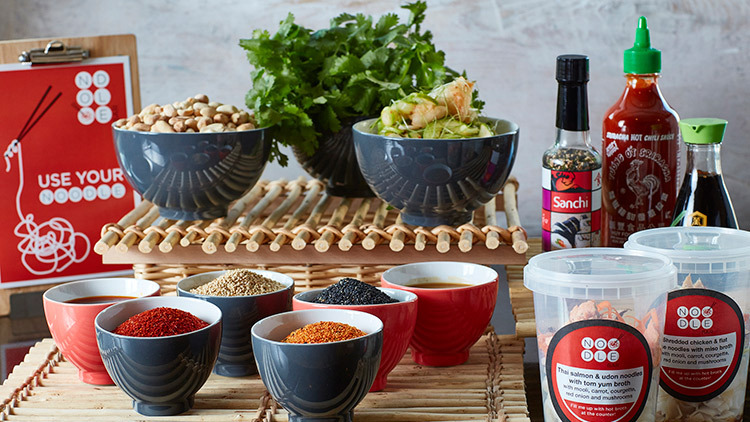 Customers can also add extra toppings to their Noodle Bar pot from the selection of add-ons which includes fresh coriander, toasted sesame seeds or chilli flakes. A nifty pot ‘clutch’ means customers can eat their noodles on the go. A two-tone bold Asian-inspired graphic design style has been selected for the branding and communications to attract customers. Recipes include; Darn! hot chicken with miso broth, Korean BBQ tofu with miso broth and Pork belly with tom yum broth. Oatily awesome is designed to capitalise on the customer trend to ’breakfast at work’. Nearly one in seven breakfasts are now eaten outside of home, with 69% of these ‘out of home’ breakfasts eaten at work, and 15% are eaten on the go. Customers want breakfast options to be convenient, cost-effective, healthy and portable – and that’s where our new porridge concept ‘Oatily Awesome’ comes in. Our sideways look at porridge moves it away from being worthy and boring to exiting and fun. Graphics and branding are based on the three bears characters. Fun floor paw prints and giant bear cut outs are designed to attract customers to look again at the humble porridge. Oatily awesome is stunningly merchandised on wooden boards with a range of toppings for customers to choose including; seeds nuts and dried fruits to add to chia, quinoa and multigrain porridges. We have developed brand new vegetarian, vegan and gluten free ranges as part of DARE (Delicious And Responsible Eating). This is in response to changes in customer tastes and expectations and reflects the trends we see in successful high street operations. The appeal for vegetarian and vegan foods is expanding beyond customers who avoid animal products for ethical reasons. Our new ranges appeal to a much larger customer base of ‘flexitarians’ who are looking for what they perceive to be healthier, ‘cleaner’ foods. To discuss how our food concepts could improve your workplace catering contact us.